The Reid House is a private residence, please respect the residents' privacy by remaining on the sidewalk as you examine this historic home. What is known today as the Reid house was built in 1900, designed by Albert Held for Charles L. Hoffman. 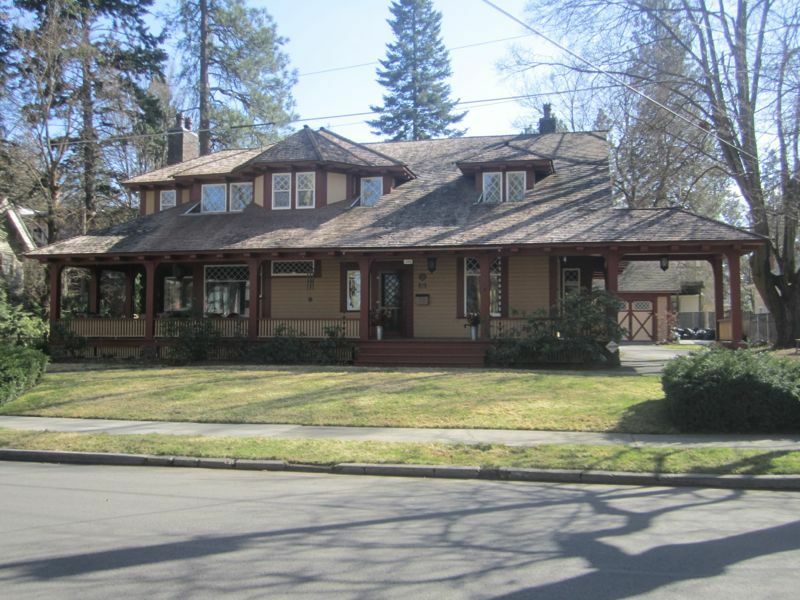 The Reid house is a great example of the Bungalow style in Spokane. Looking at the Reid house from the street the most notable feature is the shallow pitched gable roof. Notice the large front porch with prominent columns and exposed rafters. 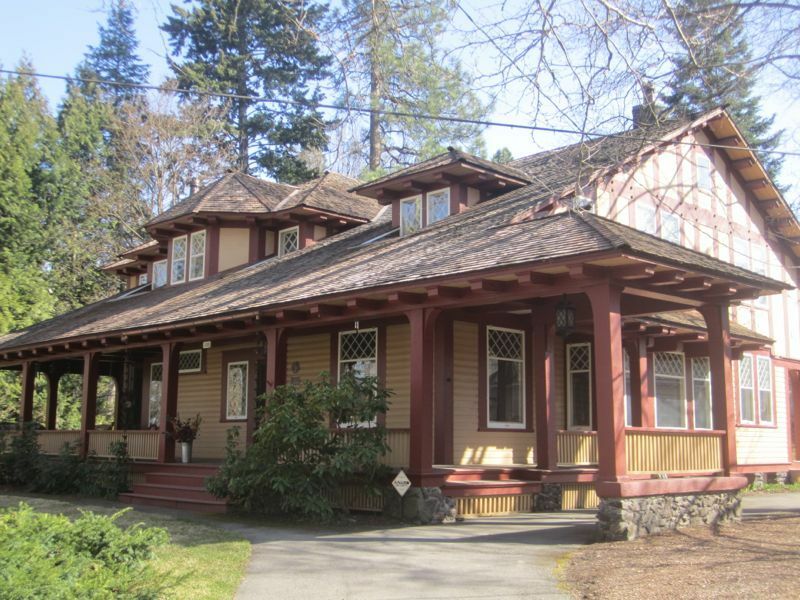 The roof flows from the peak over the dormers to the front porch of this one and a half story home. The house came complete with a carriage house when it was built. 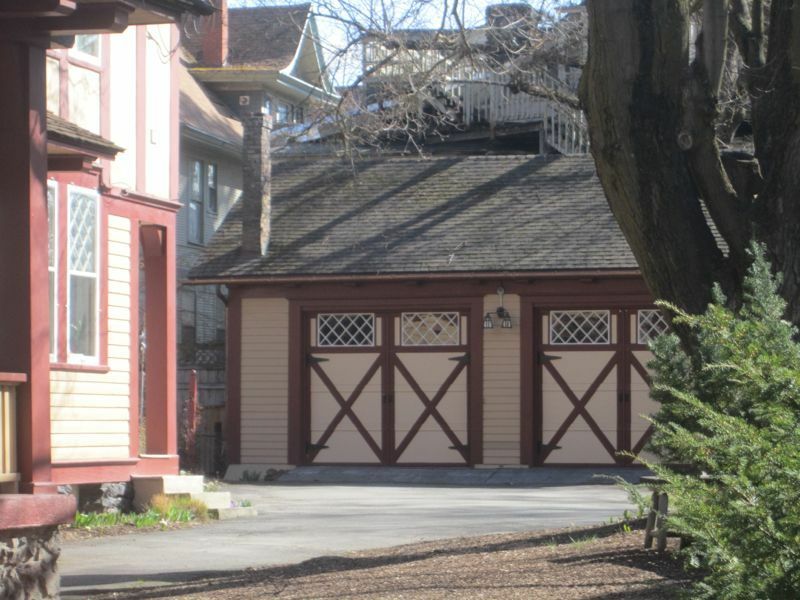 The one story carriage house is built in a similar style to the main structure and is located on the South West corner of the lot. The home was one of the architectural gems of Spokane, and was part of a neighborhood of the new elites wealthiest families including Amasa Campbell, John Finch, Harry R. Allen, Aaron Kuhn and the Reid family. In 1902 Aaron Kuhn bought the home. Kuhn was born in Germany in 1857 and came to America in 1873. Kuhn was a genuine American pioneer success story. He traveled first to Salt Lake City where he established a retail store, then traveled to Elko and Tuscarora Nevada. After that he started in Pierce City, Idaho finally moving in 1883 to Colfax, Washington. In Colfax he began making investments in land and wheat particularly. Kuhn became one of the best-known wheat producers and Nelson Wayne Durham reported at the height of his prominence he "shipped a million and a half bushels in a single season." 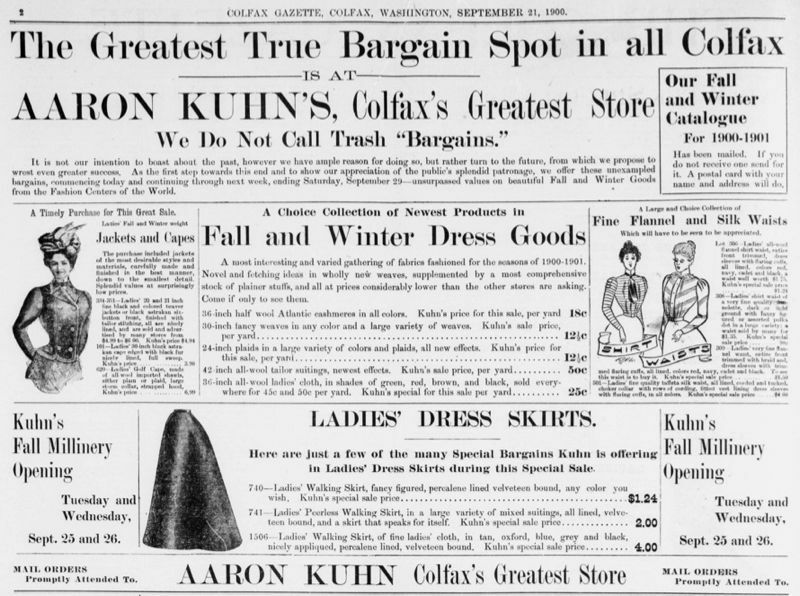 In 1900 a newspaper advertisement he proclaimed, "The Greatest True Bargain Spot in all of Colfax is at Aaron Kuhn's, Colfax's Greatest Store We Do Not Call Trash Bargains." In 1902 he sold all of his interests in wheat and in his store and moved to Spokane. Once in Spokane Aaron Kuhn became greatly invested into banking and was a member of the board of many different banks around the inland northwest including the Davenport National Bank in Davenport, WA, the Garfield National Bank in Garfield, WA and the Bonner County National Bank in Sandpoint, ID. Aaron Kuhn was also held a controlling interest in the Traders National Bank in Spokane. Aaron and Leah Kuhn lived in the house until 1914 when they sold it to Samuel and Edith Galland. Samuel and Edith Galland lived in the house for 7 years selling it to Charles Wickersham and his wife Vera. The Wickershams lived in the home while operating a shoe store downtown. Unfortunately the shoe business folded and the Wickershams were forced to sell the house to Dr. Peter Reid in 1923. Dr. Peter Reid was a surgeon who met his wife, Jean Louise Ballyne Reid, while serving as a surgeon during the first World War in London, England. Dr. Reid's son, Robert Reid also became a doctor and lived in the Reid house until he died in 1982. 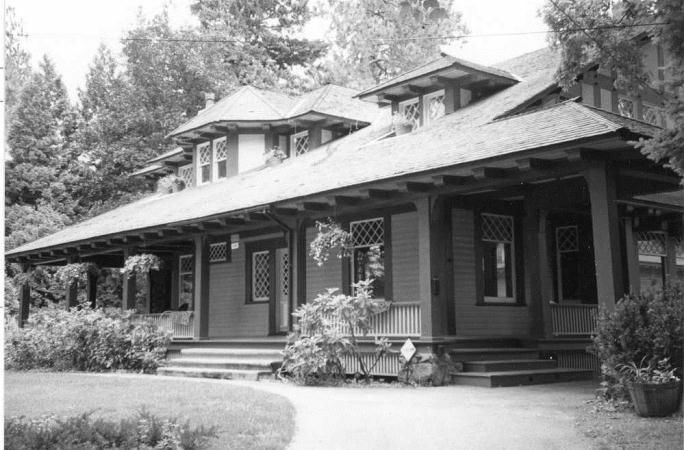 Although for a short time the Reid House served as a venue for events, the Reid House is unique in its history as it has been a single-family residence for over 90 years and continues to be a single-family residence to this day. Voice Courtesy of Zachary Wnek, Text taken from The Spokane Press, February 26, 1903. Zachary Wnek, “Reid House,” Spokane Historical, accessed April 20, 2019, https://spokanehistorical.org/items/show/312. Durham, Nelson Wayne. History of the City of Spokane and Spokane County, Washington: From Its Earliest Settlement to the Present Time. Vol. 2. S.J. Clarke Publishing Company, 1912. Yeomans, Linda. "Spokane Register of Historic Places Nomination Form: Reid House". Spokane City/County Historic Preservation Office, February 16, 2000. Yeomans, Linda, and Spokane City / County Historic Preservation Office. Historic resources inventoryâ€¯: Browne's Addition Historic District. Spokane, Washington: Spokane City/County Historic Preservation Office, 2001. "The Greatest True Bargain Spot in all Colfax." The Colfax Gazette, September 21, 1900. "The Traders National Bank." The Spokane Press, February 26, 1903.